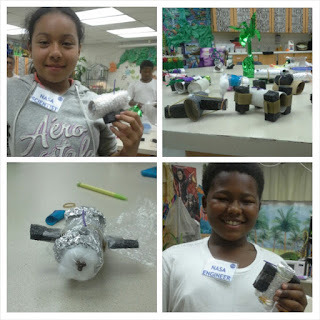 Did you know NASA has created their Beginning Engineering Science and Technology (BEST) lessons to help K-8th grade students understand the Engineering Design Process? The Engineering Design Process is a series of steps engineers use to guide them in problem solving. Engineers must ask a question, imagine a solution, plan a design, create that model, experiment and test that model, then take time to improve the original – all steps that are crucial to mission success at NASA. Throughout the Building a Satellite to Orbit the Moon and Launching a Satellite activities, the emphasis is for students to understand that engineers must “imagine and plan” before they begin to build and experiment. To successfully complete the NASA BEST Activities, students must draw their ideas first before constructing. Students transform into NASA Scientist and Engineers as they create their own satellites using a cardboard tube and general building supplies including buttons, bubble wrap and aluminum foil. Then students must build a balloon powered rocket to launch their satellite. These highly engaging and multifaceted hands-on learning experiences are aligned with the Common Core State Standards and can be used to support core content curriculum in the areas of math, science, and language arts. Visit RAFT for their incredible assortment of materials for NASA BEST Activities and general building supplies.